That’s a pretty sinister face for a not-so-sinister name, Lucy. but how do skeletons sweat? But how do skeletons talk? But how do skeletons smoke? But how do skeletons squint? That fifth panel is the absolute best. 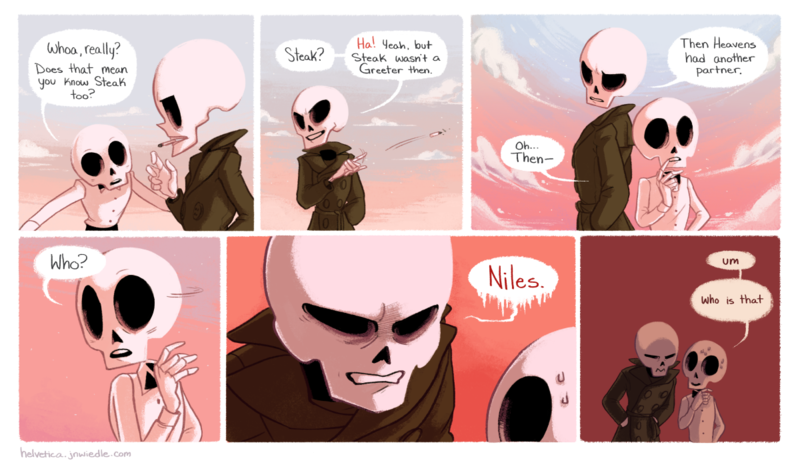 Niles we’re Skeletons, this makes very little sense! I know Fraiser, but lets just roll with it. Great, now I’m going to be thinking of Fraiser every time this Niles is spoken of. Skeletons can’t age, they’re dead! Lucy gains a magic nose when he turns to the side. The nosey-looking skull protrusion might just be the part of the skull where the bridge of the nose starts, right before the cartilage takes over. It sticks out a bit in some real people, but it’s bound to be extra prominent when rendered in a toony art style. Pane three is GORGEOUS. This entire comic is. Wonderful work so far. Also, I like Lucy’s face in panel 2… da best! Oh!! i love the color transition on the pannels =D! we don’t… we don’t like niles?